The Guardians of the Galaxy Vol. 2: Gear Up and Rock Out! 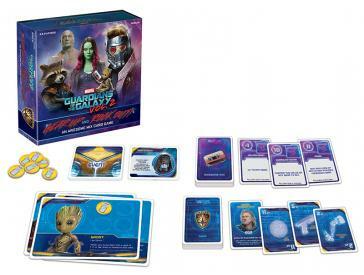 An Awesome Mix Card Game offers all-new game play with your favorite ragtag team from the hit movie franchise. Do you have what it takes to keep the music playing? Play as your favorite intergalactic hero as you do whatever it takes to avoid ending up with the worst gear. Custom Event cards add a new twist to every round and all bets are off when Ego comes into play. Bluff, trade and steal your way to victory! For ages 8 and up, 3-8 players and contains 8 player cards, 24 event cards, 52 gear cards, 38 awesome mix cards, 32 battery chips, and instructions. My Opinion: I have never played this game before so it was interesting to get used to as you need to rock out and not run out of batteries. I had so much fun playing this.